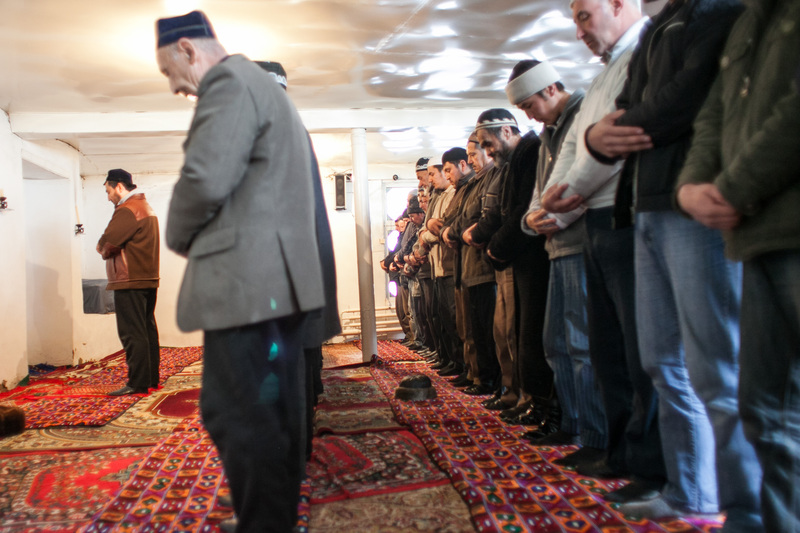 When EurasiaNet.org visited Kara-Suu on Friday, February 13, the two-story mosque – a stone’s throw from the Uzbekistan border – was half-empty and surrounded by police. Government officials introduced a new imam. Kamalov had been arrested on February 9 for allegedly encouraging militants to fight alongside the Islamic State (IS) in Syria and Iraq, charges his supporters say are absurd and which appear intended to silence a prominent critic. "The imam in custody has not just appealed for the creation of a caliphate but has also been telling believers about the war in Syria and making extremist statements," Zhenish Ashirbaev, an Interior Ministry spokesman told Interfax on February 10. Ashirbaev added that Kamalov is also suspected of belonging to Hizb-ut-Tahrir, a London-based Islamist group banned throughout the region (and which has never been linked to violence). Police “found extremist books and other materials at the suspect's house and in the mosque," Interfax quoted the spokesman as saying. In connection with Kamalov’s arrest, Kyrgyz security forces have fanned out across southern Kyrgyzstan, arresting dozens of alleged militants. Security officials contend that the raids have led to the recovery of illegal weapons and extremist literature, and have disrupted cells that were supposedly recruiting Kyrgyz citizens to join IS. Kamalov, 36, is the son of Muhammadrafiq Kamalov, a prominent imam who was killed in August 2006 during a joint operation by the Kyrgyz and Uzbek security services. The details of the father’s killing are still murky; Kyrgyz police said Muhammadrafiq Kamalov was a terrorist but presented no evidence to satisfy independent observers. The younger Kamalov began leading prayers at the Al-Sarahsiy Mosque after his father’s death, though he was never approved by the Muftiate, the state-run Muslim board that appoints imams and ensures they toe the government line. Just like his father, Kamalov reportedly permitted Hizb-ut-Tahrir members to worship at his mosque, but he publicly renounced links with the organization and its aim of establishing an Islamic caliphate. Indeed, EurasiaNet.org correspondents have heard Kamalov use his sermons to repudiate violence done in the name of Islam and to criticize Kyrgyzstanis fighting for various rebel factions in Syria. In an interview with EurasiaNet.org only weeks before his arrest, Kamalov said he had received death threats from IS supporters for his criticism of the terrorist movement. “I have many enemies because I tell people the truth. I am not afraid of anyone save Allah. They can only take my life, not my soul,” he said. Supporters vigorously dispute the government's characterization of Kamalov as an Islamic militant and say evidence against him is being fabricated. Several residents of Kara-Suu separately said that police used pressure and intimidation to obtain witness testimonies against Kamalov. Kyrgyzstan's security services are often accused of exaggerating the threat of extremism to justify abuses or hide their own nefarious activities. Suyunbayeva, Kamalov’s attorney, links the imam’s arrest to a late December 2014 meeting between the security services and religious clerics in Osh where he openly criticized the government’s religious policy, especially the common practice of rounding up believers and pressing them with extremism charges—sometimes to extract bribes. “He said [at the meeting] that people are fleeing to Syria to escape torture by Kyrgyz law enforcement agencies,” Suyunbayeva said. A Western official is skeptical of the charges against Kamalov, suggesting that any proof against the imam was fabricated. “Come on, is it illegal to talk about a caliphate now?" the official said, expressing concern the imam would not get a fair trial. Pointing to Kamalov’s ethnicity – he is Uzbek – some observers feel that officials might be using the so-called anti-terrorism sweep to snuff out Uzbek agitation for civil rights. Following interethnic violence in 2010 that disproportionately targeted the minority Uzbek community in the south, and which implicated some Kyrgyz security agents in extrajudicial killings of minority Uzbeks, many Uzbek leaders fled persecution in the region. Kamalov was one of the most prominent Uzbek community leaders left. Kamalov was briefly detained in early 2011, but under pressure from his Kara-Suu supporters he was released. Since then, the central government has reasserted its authority in the south. Observers are divided over how much Kamalov’s arrest will affect stability in southern Kyrgyzstan, which is still grappling with the consequences of the 2010 bloodletting. Approximately 500 Kamalov supporters gathered on the day of arrest, February 9, though police managed to disperse them without resorting to force. During Friday prayers four days later, the streets were still filled with police and Kara-Suu residents said they were spooked. But observers agree that the arrest is likely to have a counterproductive effect on the government’s efforts to curb recruitment of potential IS fighters. Osh-based journalist Shokhrukh Saipov contributed reporting.